A dark comedy zombie film. Directed by Jim Jarmusch. Iggy Pop as a zombie. Tom Waits. Bill Murray, Adam Driver, Chloë Sevigny and a samurai-sword wielding Tilda Swinton. And that supporting cast. Are you kidding me!? Hellripper - "All Hail The Goat"
I freely admit to my love and adoration of the art of Sam Heimer. Is there any artist whose vintage-styled illustrations better encapsulate all things Halloween?? Three years ago, I took a chance on a new collaborative project between him and fellow Halloween artist, Jason McKittrick. 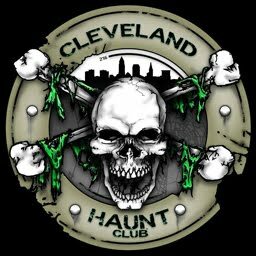 The project was called The Order Of The Thinned Veil, a year-long celebration of all things Halloween. 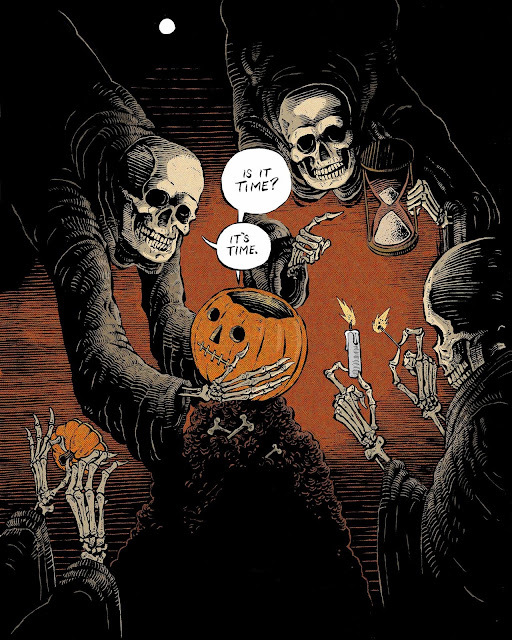 Upon subscribing to one of three levels, new Order members received amazing packages filled with illustrations and sculpted figures, along with a plethora of other cool Halloween ephemera. You even got a package of pumpkin seeds to grow your own in time to carve for the 31st! I was instantly hooked. It was such a fun project to keep the Halloween feeling going throughout the whole year. I jumped on last year's subscription, and it was even better than the previous year's offering. My Heimer collection of illustrations and McKittrick collection of sculpted figures continues to grow and I am fully hooked on the Order! And now is your chance to join me! 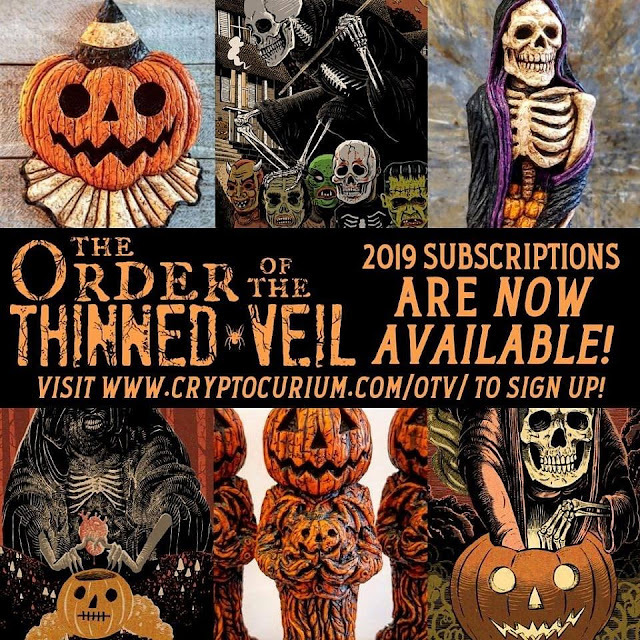 It was announced today that the 2019 Order Of The Thinned Veil subscriptions are now up and ready to order. Three levels to match your level of dedication (and wallet). I CAN NOT recommend this fun project enough! So many cool little touches make this a mandatory Halloween fan's addition. Cool Halloween tchotchkes and even cooler Halloween art. 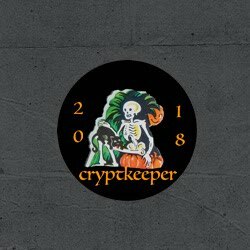 Our Halloween season starts today! Get over to the Order Of The Thinned Veil page, check out all the cool stuff and subscribe! How can you not!?!? Council Of Nine - "Circle Of The Sun"
Feel yourself enveloped by the deepening darkness and despair. I absolutely love, love, love this dark ambient track from Council of Nine! Desiderii Marginis - "The Silence Of A Thousand Years"
Back in November, I successfully completed my second annual Pumpkin Dump. That is, instead of simply throwing all of my jack-o-lanterns away after Halloween, I decided to do something a bit more creative with them. I found a unique, visible location in my area to quickly and secretly set up all my jack-o-lanterns! My reasoning was twofold: first, it was a fun and innocent way to extend the Halloween season by a little bit and share it with everyone who discovered the set up, and two, after removing all wax and other contaminants, it provided a natural snack for the local deer, raccoon, chipmunk and squirrel population. Photo courtesy of David Fitzgibbons. Boom! There it was! A totally awesome photo of my last pumpkin dump! It was a bigger success than I had anticipated. I don't think he even knew the story behind this or who set it up (although he may have been able to guess)! I was so excited when I saw it, I immediately revealed the backstory and asked his permission to post it here, so thank you Dave! You have captured the eerie fun in a way that I couldn't, and provided a most unexpected surprise! I see a freelance photography gig in your future, say next October? Amazing shot, sir! !